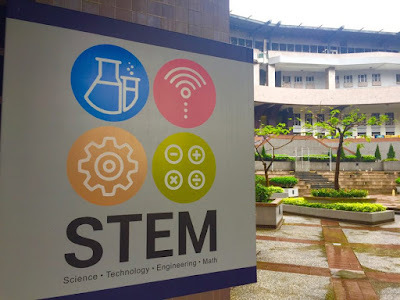 Although I’m formally based in Tsing Yi, being a STEM EF has given me the opportunity to regularly teach classes at various different schools around Hong Kong, and today is no exception. I start my day off at 9:30 by teaching a lesson about presentation skills at a campus in Wan Chai. This consists of me trying to convince around 15 half asleep teenage boys that presentations aren’t so bad and nobody is going to burn you at the stake if you make a mistake whilst speaking. Naturally they don't believe me, so I somehow force them to get up and present to me and each other a description of the pen that they’re using to make notes. Most of the students simply tell me it’s a pen and run away back to their friends and giggle, however today one boy tells me that his pen “is a device for changing his life.” For a moment I stand in front of this kid utterly amazed (I’ve never heard such a profound statement from a student before), but I quickly remember to pick up my jaw and praise him for such a great description. At the end of the lesson, the same boy comes up to me with a presentation script he’s written for an upcoming assignment and asks for some feedback. Together we go through it and fix some basic grammar issues but other than that it’s pretty good. He leaves feeling great and so do I as I feel I’ve made some impact by 10:30 am, which is a pretty nice feeling! I catch the MTR back to Tsing Yi, cramped in the train carriage like a sardine in a tin can. When I get to Tsing Yi I go straight to my office, which is based in the engineering framework office and is filled with around forty local teachers. I pass the rest of my morning catching up with emails and admin in peace. Around 12pm, I saunter downstairs to the CILL (the Centre for Independent Language Learning) to see the other PCs and get lunch. When ordering lunch it's important to remember that the Cantonese speakers have their own secret menu which consists of much nicer food seemingly only available to them. I’ve tried various times to order the food from the secret menu, but to no avail, therefore I’m left with only two choices, chicken curry with rice or spaghetti bolognese with cheese. A big choice indeed. Today I chose the spaghetti, and take it back to the CILL. In the afternoon the real fun begins as we do our bit in improving the ‘English Language Learning Environment’ on campus. This week the CILL has invested in a Nintendo Switch, which they connect to a big projector in the canteen so we can get students to play against each other, whilst myself and the PCs commentate over a speaker system to the whole room. Typically the students choose to play FIFA or Mario Kart, both of which they’re terrible at, so this gives us the opportunity to berate them in front of their friends. This generally upsets most people in the canteen who are merely trying to enjoy their lunch without having to listen to us, but we always remind them how important it is for their education. After the banter of the commentating, I choose to treat myself to a well-deserved can of Coca Cola. But there’s no rest for the wicked and I’m soon back hard at work, now meeting up with students to discuss and give feedback on their engineering reports. As a STEM EF, I’ve got some understanding of the technical content of which these students study, however the difficulty often lies in understanding what students are actually talking about, which can make helping them with their work somewhat difficult. Nevertheless, I find a smile and a bit of encouragement is all they really need and therefore both the students and I always end our discussion fulfilled. That just about brings me to the end of my day. From then on it’s a 30-minute bus ride back to my flat in Prince Edward, getting me home around 7pm. No two days are the same when you work in STEM, but you can always rely on the students to make it memorable.